Pokki is the PUP that uses misleading techniques to prevent removal. Use Reimage to locate malicious components and get rid of them faster than with uninstall instructions. A full system scan blocks virus reappearance and prevents traffic to malicious domains. Pokki is a legitimate application developed by SweetLabs, Inc in 2014. It is represented as a tool allowing to search for apps, files, power options, Control Panel features, and other options on Windows 8 and 10 with one click on the Start button. However, currently, most of the reliable AV engines detect it as PUP (Potentially Unwanted Program) or Win32/Pokki, while security experts recommend people to stay away from it. It seems that from a regular browser hijacker that replaces start page and search engine, it developed into a quite aggressive Windows Start Menu promoting misleading apps. Therefore, instead of being called Pokki’s Windows 8 Start Menu, it's referred to as a Pokki update virus. 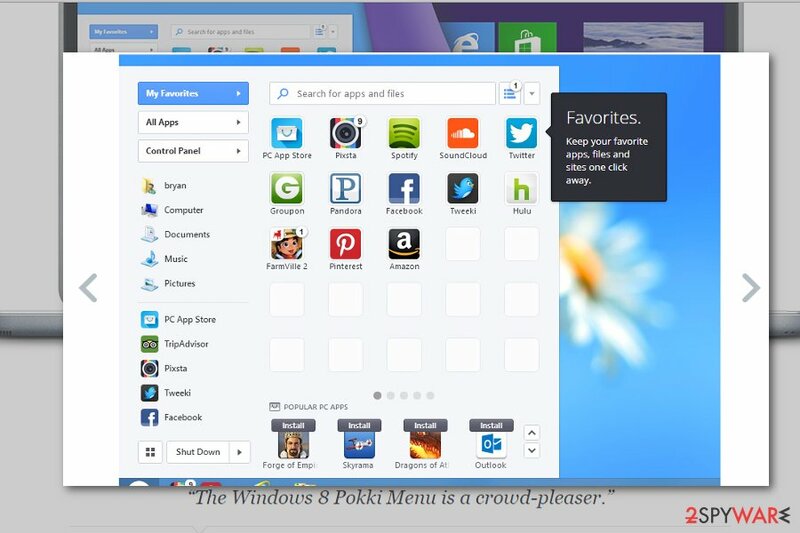 Pokki is a program created by SweetLabs Inc which allows changing start menu on Windows 8 or 10. With the help of this app, users can simulate mobile app interface. Generally, this application is safe and does not include any malicious features itself. Or rather used to be safe. Even though it can hardly be described as a malicious virus, it can definitely be described as PUP due to tricky distribution strategy (“Bundling”), as well as highly suspicious behavior. The program has an official download site where a free download is available. However, most frequently it sneaks into the system unnoticed with the help of freeware. For this reason, users often refer to it as Pokki virus. However, technically speaking, this is not a right term to describe it. It's a potentially unwanted application that can only cause problems while browsing the web. However, it does not mean that these activities should be tolerated. Users usually learn about Pokki update virus when they unexpectedly receive a notification urging to install available updates for the program they haven’t installed. We have already told that program can get into the system with the help of software bundling strategy which allows infiltrating devices silently. However, in 2013 the program spread pre-installed on Lenovo computers with Windows 8 operating system. 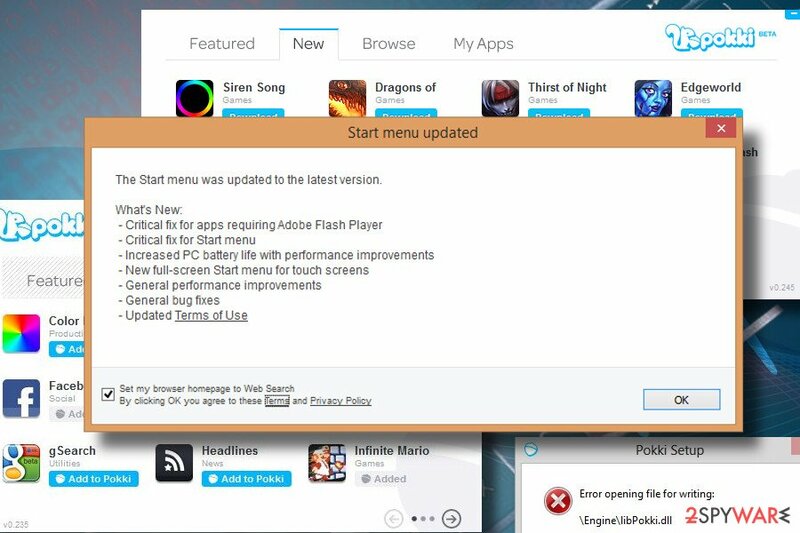 Though Pokki update virus is known as bloatware, and these programs once in a while need to be updated too. Security specialists recommend finding and uninstalling this program instead of updating it. Authors of Pokki offers its promotional services to app developers. 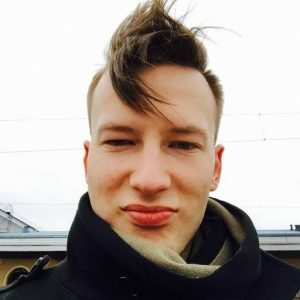 The developers tell that they have a partnership with computer manufacturers and can promote programs through Windows Start menu, App Store, and Game Arcade. Hence, such description proves that it's an ad-supported program. Security specialists from LosVirus warn that developers of PUPs or even malicious apps might take advantage of such service. For this reason, we recommend performing Pokki removal immediately. If it arrived on the system in the software bundle, you should use anti-malware software, like Reimage, to get rid of all its related components. Though they claim that such information is used purely for statistical purposes, they also mention that third-parties which promote their content via Pokki app may also use tracking tools. Thus, they cannot be liable for what tools these parties use and how they manage collected information. In short, while using this app, you may notice more excessive advertising. 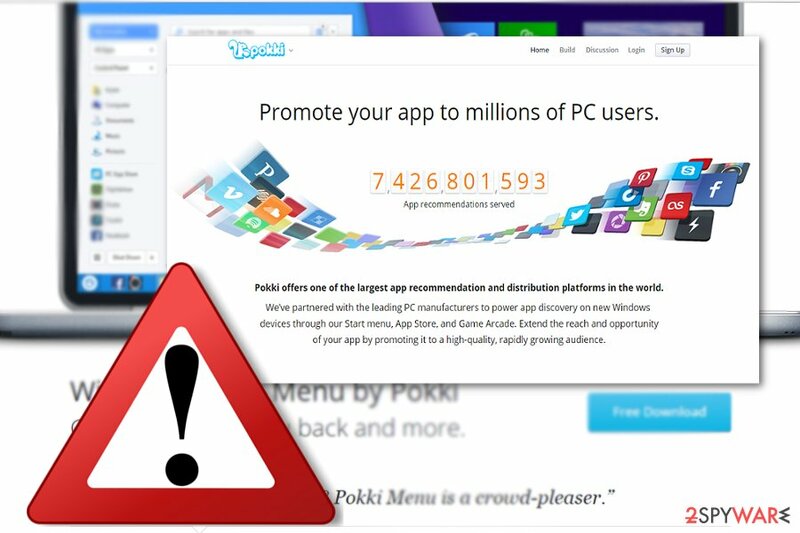 Pokki update virus can also have a negative effect on Windows 8 and 10 performance. People noticed that right after the infiltration of this PUP, the system gets more sluggish and unresponsive. One of the reasons might be a high CPU usage by pokki.exe or HostAppServiceUpdater.exe files. Besides, it may run multiple processes and cause slowdowns during the active phase of update downloading and installing. Sometimes, a prolonged Windows startup process can be noticed. That's because Pokki adware can change Windows startup and enable related components during startup. Thus, that's yet another reason why you should respond to your web browser's hijack and get rid of this app without a delay. Besides mentioned distribution method via freeware, you can also download the program from its official website. Additionally, this app might be promoted via sponsored domains. Pokki ads might be disguised. In other words, you might click on the link which does not indicate this program but redirects you to this domain. In order to avoid installing similar programs, pay attention to the installation wizard. Despite what program you are about to install, optional add-ons may be promoted. In order to detect them, choose “Advanced” installation mode. Unmark irrelevant programs and continue proceeding further. Likewise, you will be able to prevent “Pokki hijack” and similar questionable tools. You can remove Pokki manually via the Control Panel. If you still spot pokki.exe running in the Task Manager, you can scan the system with malware elimination tool. If you do not have one, install it as it will come in handy dealing with more elaborate threats. After you complete Pokki removal, check the list of system apps. Additional programs may have been installed too. Uninstall them without any consideration. Moreover, you should look through browser extensions and remove unknown entries. Browser reset is also recommended to delete tracking cookies or other spying technologies. Here, look for Pokki or any other recently installed suspicious programs. Wait until you see Applications folder and look for Pokki or any other suspicious programs on it. Now right click on every of such entries and select Move to Trash. When in the new window, check Delete personal settings and select Reset again to complete Pokki removal. Once these steps are finished, Pokki should be removed from your Microsoft Edge browser. Here, select Pokki and other questionable plugins. Click Remove to delete these entries. Now you will see Reset Firefox to its default state message with Reset Firefox button. Click this button for several times and complete Pokki removal. Here, select Pokki and other malicious plugins and select trash icon to delete these entries. Click Reset to confirm this action and complete Pokki removal. Here, select Extensions and look for Pokki or other suspicious entries. Click on the Uninstall button to get rid each of them. Now you will see a detailed dialog window filled with reset options. All of those options are usually checked, but you can specify which of them you want to reset. Click the Reset button to complete Pokki removal process. ^ Pokki. Wikipedia. The free encyclopedia. ^ Neil Gane . 'Free' illegal downloads could cost you big in malware. The Straits Times. Breaking news, Lifestyle and Multimedia News. ^ Seth Rosenblatt. 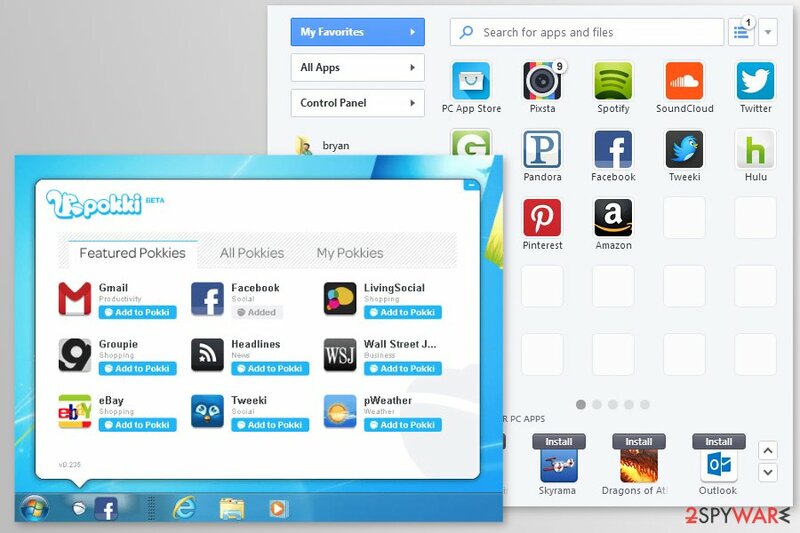 Lenovo's Pokki deal targets Windows 8 app-athy. CNET. Product reviews, how-tos, deals and the latest tech news. ^ John Leyden. C’mon Lenovo. 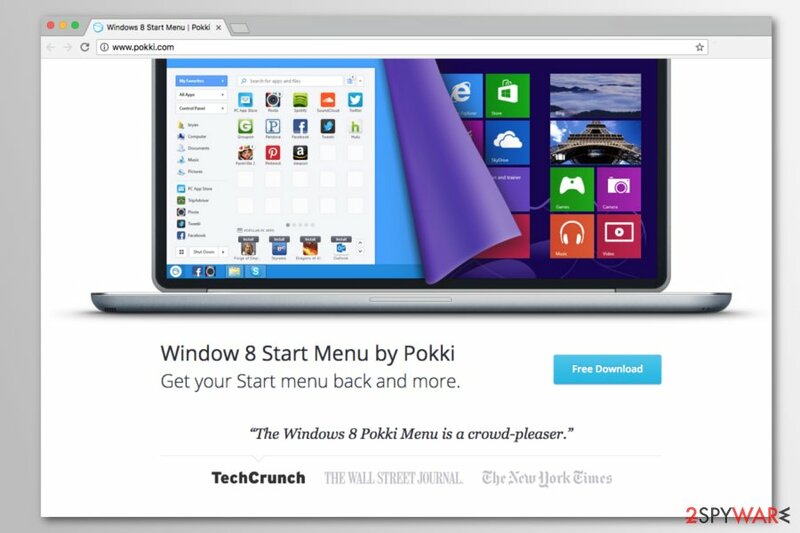 Superfish hooked, but Pokki Start Menu still roaming free. The Register. Tech and science news. ^ Eliminate computer threats. Losvirus. Malware removal guides in Spanish. ^ Adam Dachis. Do You Read Privacy Policies (and Do You Understand Them)?. Lifehacker. Tips, tricks and downloads for getting things done. ^ Christopher Elliott. Yes, There Are Too Many Ads Online. Yes, You Can Stop Them. Here’s How.. HuffPost. Breaking news, U.S. and World News. This entry was posted on 2019-04-01 at 00:58 and is filed under Adware, Viruses. You can quickly scan the QR code with your mobile device and have Pokki virus manual removal instructions right in your pocket. How did you remove Pokki virus?